Colonel Steve Austin is reunited with his childhood sweetheart Jaime Sommers. 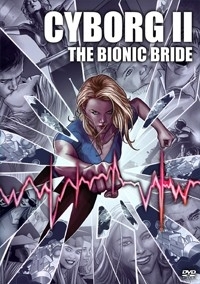 As true love blossoms, tragedy strikes, forcing Steve to make the most difficult decision of his life -- saving Jaime by making her the world's first Bionic Woman! But what price will he have to pay? Will their love survive? Find out as Bionic Bob retro-cons the origin of Bionic Woman, removing the villain and amnesia pain subplots, into a straight forward soapy love story. To take over 5 hours of Bionic Woman origin story and boil it down and retro-con it into a fun romantic adventure. Rogue-theX and all the Bionic Believers out there! Bonus Features include a short fan edit of the Bionic Woman episode "The Deadly Missiles" which has been retro-conned into Jaime's first OSI Mission. The most negative thing I can say about this edit is that Lee Majors really can't sing. Of course, BionicBob can't fix that, but it was a bit painful to hear twice. But other than that, this is yet another pretty much perfect edit. Highly enjoyable and highly recommended. I found myself wondering how often Steve Austin accidentally got his chest hair caught in those zip-up track suits. Not that he ever zipped them up. There is great chemistry between Lindsay Wagner and Lee Majors, and I'm glad there was the final scene after the credits--those characters deserved that ending, though I wish it had been written and directed in a less silly fashion. Any slight criticism I have is with the source material, and even then, looking back, this show wasn't aimed at adults. I was 9 or 10 years old when I first watched these in their original form and it was my favorite show (along with the reruns of the 60's Batman and Speed Racer cartoons). This still appeals to that kid in me, though the adult I have become cringes just a little now and then. More than anything though, this resurrects my love of the show and my memories of it. After Yvonne Craig as Batgirl, Lindsay Wagner was my second big celebrity crush. It was great to see her outside of a Tempur-Pedic mattress infomercial again! I know all too well the challenges of presenting a TV series fanedit which concentrates primarily and almost exclusively on the main character (some may say "soap-opera") elements of the story. You run the risk of boring the pants off some viewers if you go over the top, so it's a balancing act which demands skillful judgement from the editor. In the hands of an old-hand (well, he's not THAT old) such as BionicBob, the chances were good that this romantic tale of our two favourite Bionic heroes, Steve Austin and Jaime Sommers, would succeed more than fail. Of course, it does help if you're a fan of the shows in questions, as you will already have some emotion invested into the characters. Like Bob, I kinda grew up on a weekly dose of The Six Million Dollar Man and The Bionic Woman, so all his Cyborg edits have interested me greatly. Now, ideally I would have watched this one on Valentine's Day, but alas, my fiancee was away on business in Dubai, no less! So, a few days later once she had returned, we settled down on Sunday morning to have breakfast in bed and watch the origins of Jamie Sommers and the parachuting accident which would result in her becoming The Bionic Woman. More than that though, we get to discover the long friendship between Jamie and Steve which would eventually develop into a fully fledged romance whereby the two plan to become wedded. Apart from the opening 5 minutes or so, Bob bravely decides to jettison any ideas of Bionic super-heroics - don't expect any guest starring villains in this one, this is purely a tale of romance and a very good one at that. What immediately struck me was just how good Lindsay Wagner was in the role of Jamie Sommers. It had been a while since I had seen her in the show, and her performance still holds up very strongly today. It's no surprise at all that she won an Emmy for her work during the series. Her likeable, natural persona comes shining through and Lee Majors plays off this very well too, meaning that the all important chemistry which is vital to a romantic story such as this, comes so easily that you're immediately drawn into caring for the characters and the experiences they go through. So, this is all well and good, but how does Bob handle editing down about 5 hours of Bionic Woman origin style story, into 102 minutes of constructive narrative which engages us, satisfies us and leaves us wanting more? The answer is simple - brilliantly. The key during an edit like this, is that you don't want it to actually feel like it's too spliced together; that it's cobbled together from various different episodes. If that were the case, I would just be frustrated all the time and want to go back and watch the original episodes themselves. Well, thankfully Bob's a good enough editor to know how to cut around such potential pitfalls. With a mixture of montages, and using a modern TV trick of starting the story with some action, and then at just the perfect moment fading to black and then having the "One year earlier" caption, this is a prime example of how to balance an edit such as this. Truthfully, I never really felt this was put together from different episodes. It really did feel like one big TV movie and Bob, for that, I salute you. Excellent work. If there's a very slight criticism, it would be the use of "that" song from Mr Majors. Not once... but twice! I honestly think you should have stuck with your original intentions of replacing this with something a little less cheesy and "in your face". I understand why you wanted to keep it in, feeling it was integral to the story and how we as the viewer should be feeling, but to be honest, I think even by just using instrumental music of some kind, we would still get the same feeling in regards to how Steve feels about Jamie. However, on the whole this is terrific stuff. I even welled-up on a few occasions, particularly when Jamie is recovering after her Bionics fail. It goes to show just how good Wagner was in the role. Either that, or I'm just too much of an old romantic and a softy ;) Oh, and as for the surprise at the end of the credits - perfect.. just perfect! More people need to see these Cyborg edits! It's time you got some Bionic adventures into your lives people. Cyborg I was a great place to start for sure... but for me Cyborg II is even better, despite the fact that there's hardly any Bionic action and no villains to speak of. For this genre, it's a bold piece of character driven storytelling which is well acted and I agree with DwightFry's comment that it makes one wish that the networks were a bit more daring and took this approach for other shows of this kind. Well done Bob on another top-notch piece of fanediting. Now, it's really time I get around to watching Cyborg III and V! "Love means never having to say you're bionic". And now for something completely different, Bionic Bob pulls a Smallville Destiny and discards the villain of the week structure to center around the human factor and offer nothing but Steve and Jaime, Jaime and Steve. And it works fine, resulting in a sweet and engaging edit. We don't need a generic villain shoehorned in, if we have characters we care about we will want to follow them around even when they take a day off. In fact I wish the networks would dare to do this every once in a while instead of forcing the formula into everything. The narrative is well sustained, which is remarkable given its patchwork nature. We don't know exactly why Jaime "malfunctions" but given the circumstances it's better not to know. The song, however... I understand the thematic reasons to leave it in, but I kinda wish Bob had followed his initial instincts and replaced it. Let's say Mr. Majors' crooning ability is dangerously close to fingernails on a chalkboard... I think I would have also cut out the scene of Steve looking at the yearbook, as "brother-zoning" is what girls do to boys they're fond of but "just not that way". And as Steve and Jaime were always somewhat into each other, it's not very fitting. The editing itself is seamless, and if you miss some action and adventure, you'll find it in the accompanying short about Jaime's first mission. A very charming edit, perfect for around Valentine's day.